Manufacturer & Supplier of Pneumatic Controllers. 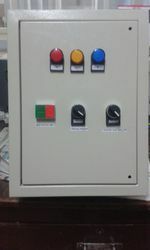 Our product range also comprises of Control Panels, Electrical Control Panels and VFD Control Panel. Backed by an efficient team of professionals, we have been able to provide optimum quality Pneumatic Controllers. These pneumatic controllers are developed in adherence with the industrial norms using advance technology under the direction of experts. Our provided pneumatic controllers are demanded is in various petrochemical industries for controlling the pressurized systems. Besides this, offer offered pneumatic controllers are available in varied specifications to our customers according to their requirements.